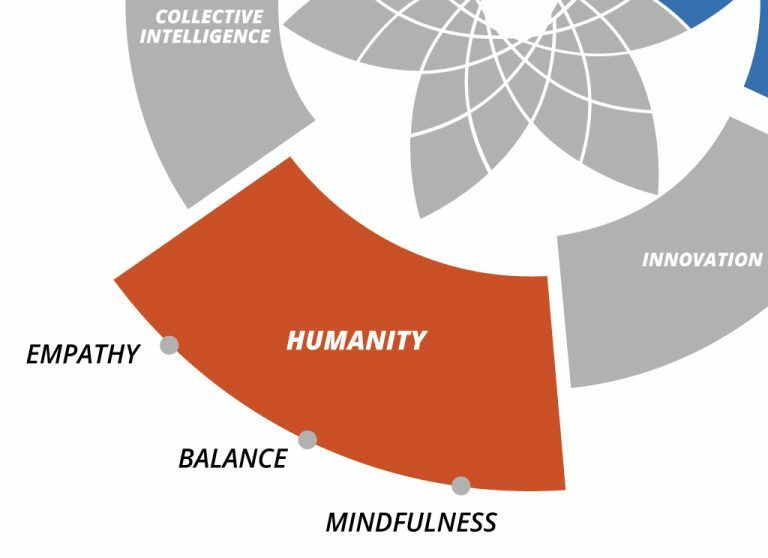 What is the Collective Leadership Compass? 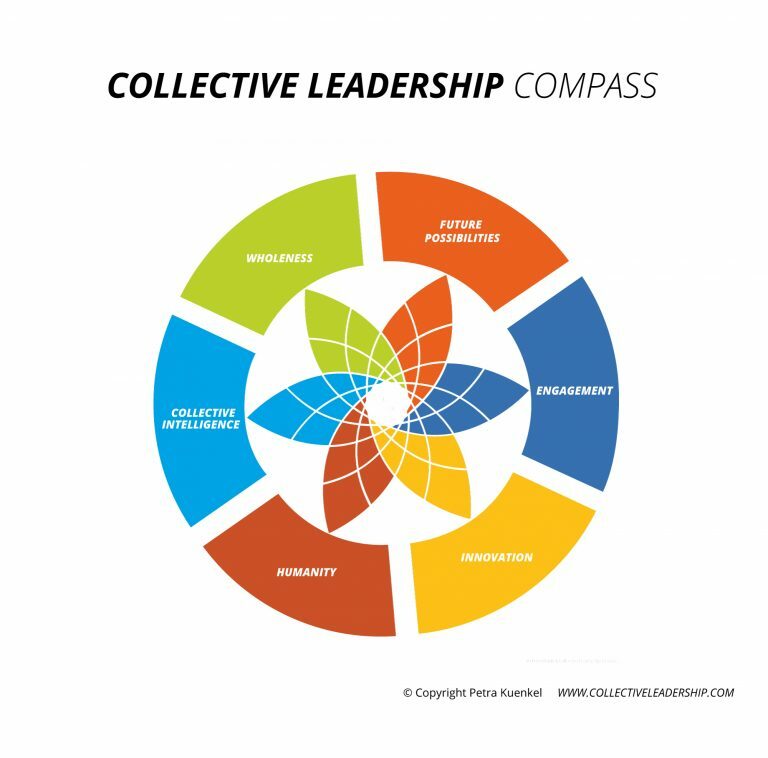 The Collective Leadership Compass can be used to learn more about yourself, your perspectives, strengths, and areas for development, and what motivated you to undertake your collaboration journey. It can also be used to plan your actions and evaluate the results. These steps, each with three actions, create a repeating cycle. The steps apply to all levels – individual leaders, groups, or a system of collaborating actors. the Individual level: Assessment and expansion of personal skills with the purpose of augmenting individual capabilities for better co-creation, capacity to lead in conjunction with others, increase self- efficacy. the Team-level: Monitoring and continuous improvement of collaboration for the purpose of collaborative group/team efficacy, refocusing team on sustainability issues, increasing awareness of interface between hard and soft skills to improve the impact of the action. the Organisational level: Planning and implementation of collaborative change. 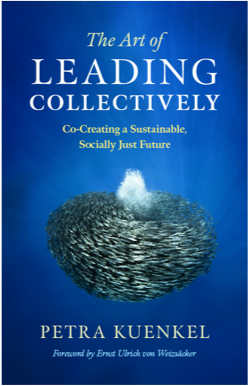 the Level of collaboration systems: planning, implementation, and monitoring of collaboration process for the purpose of building communities for change: Organization/ department or cross-sector network for sustainability goals, collaboration results, collective action, increase collaborative impact. and at the level of Complex change: Situational diagnoses and planning for addressing complex challenges for the purpose of a wide range of actors, sense-making diagnoses and solution finding, enhance system vitality and resilience, invigorate constructively, and co-creative narratives. To use the compass in your daily life, we developed an online compass tool to navigate complex change. The beta version is already accessible here: http://compass-tool.net/. More news and updates on this tool coming soon. Each dimension is further deepened through three ‘Aspects’ (see below). Using the Compass, you learn a pattern of human competencies that when balanced in yourself, your team, your organization, or your stakeholder system can lead to collaboration that achieves sustainable outcomes. Each dimension has its own dynamic and can be fostered and developed in many ways. With sufficient attention to each dimension, and ultimately to their togetherness, they mutually reinforce each others’ strengths. The purpose of the Collective Leadership Compass is not theoretical, but practical. It guides thought and action toward patterns of successful human interaction. The dimension of future possibilities refers to the human competence to take responsibility and consciously shape reality towards a sustainable future by Inspiring and empowering others, staying open-minded, observing trends, developments, and new knowledge, going beyond problem diagnose, sensing and enacting future possibilities, following through and taking a stand for sustainability. 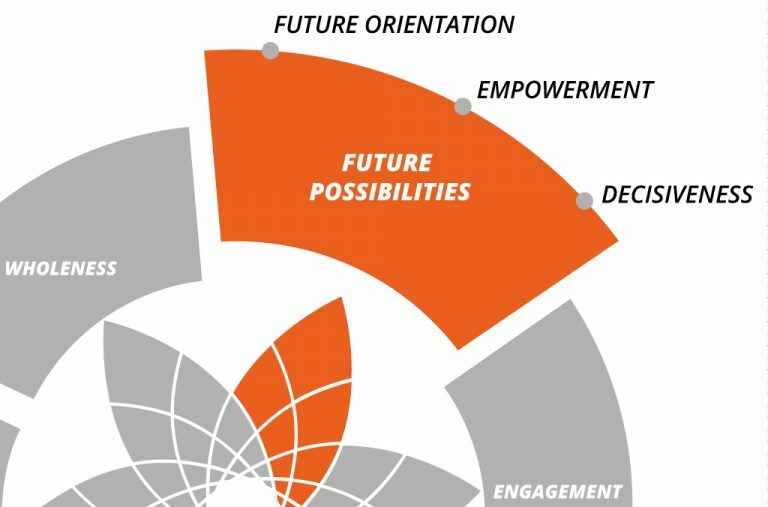 Future Orientation The way we focus on potential or opportunities and drive change for the better. Empowerment The way we inspire, capacitate and awaken passion and options for change. Decisiveness The way we commit, focus, follow-through, and measure progress. 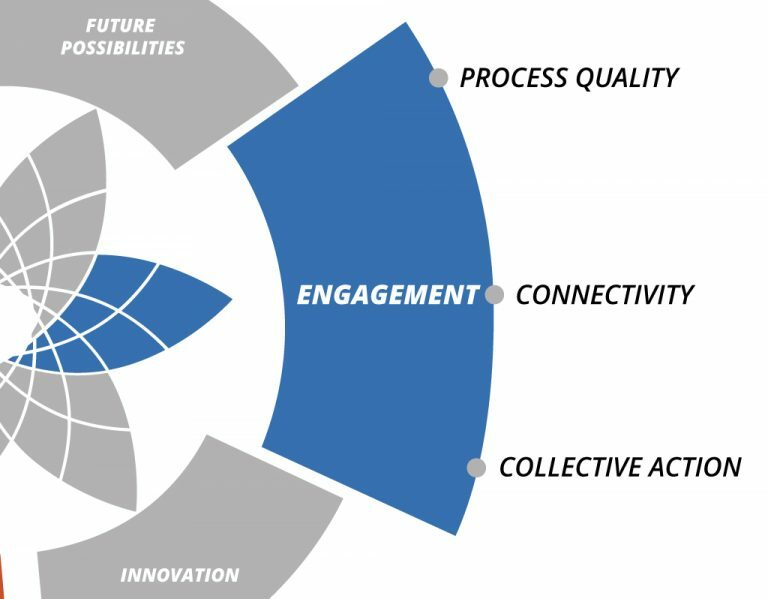 The dimension of engagement refers to the human competence to create step-by-step engagement towards building effective and meaningful collaboration eco-systems, that create trust and cohesion, invigorating network connections, fostering collective action that leads to tangible outcomes and enhanced collective impact. Process Quality The way we build step-by-step and structured engagement. Connectivity The way we foster cohesion and build networks. Collective Action The way we drive joint implementation and delivery of results. The dimension of innovation refers to the human competence to create novelty and find intelligent solutions. Innovation needs to take our shared humanity into account. 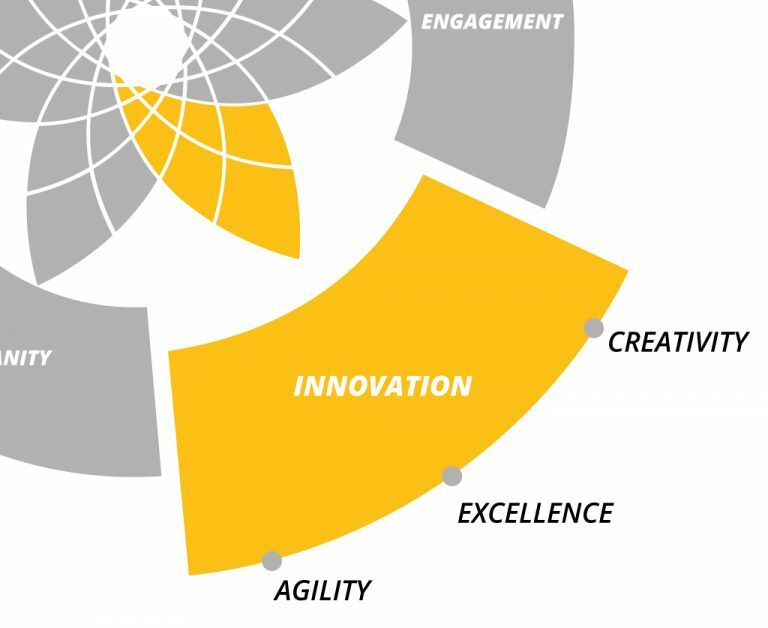 Innovation means venturing into the unknown, driving excellence, fostering creativity, acknowledging diverse expertise, building a climate of trust-based co-creation and developing the potential to spot innovative solutions to sustainability challenges. Creativity The way we nourish sources of creative energy and collective generation of ideas. Excellence The way we pursue mastery and grow knowledge. Agility The way we move through crises, stay open to change, and cultivate risk-taking. The dimension of humanity refers to the ability of each person to connect to their unique human competence in order to reach out to each other’s shared humanity by acknowledging diversity in the world and in humanity, accessing our humanity in ourselves and in others, creating an atmosphere of mutual respect, cultivating reflection and attending to inner balance. Mindfulness The way we deepen our awareness of reality in all aspects. Balance The way we integrate personal and professional aspirations. Empathy The way we embrace the perspective of others and open gateways for reconciliation. 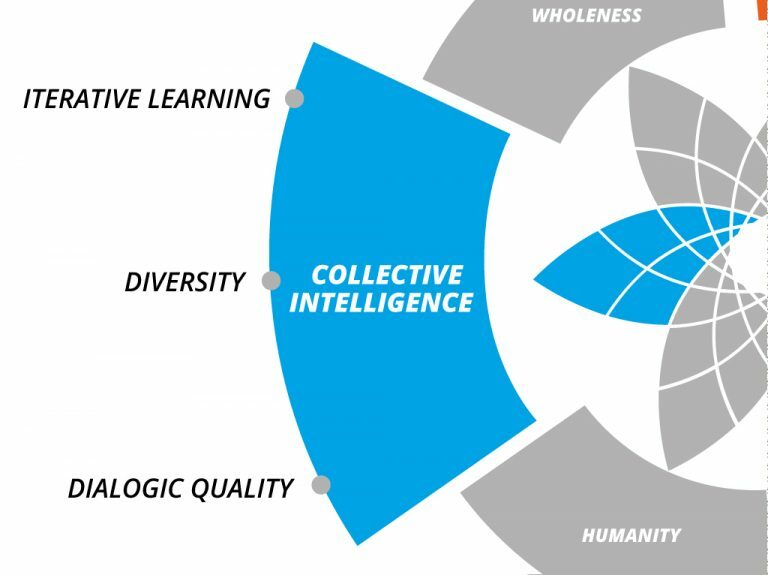 The dimension of collective intelligence refers to the human competence to harvest differences for progress by respecting difference, inviting diverse perspectives, experiences, and viewpoints for better solutions, fostering structured dialogue, valuing contributions and ensuring iterative learning. Dialogic Quality The way we attend to the structure and quality of conversations. Diversity The way we foster diversity in thought, viewpoints, background, and experiences. Iterative Learning The way we develop cycles of reflection into action. 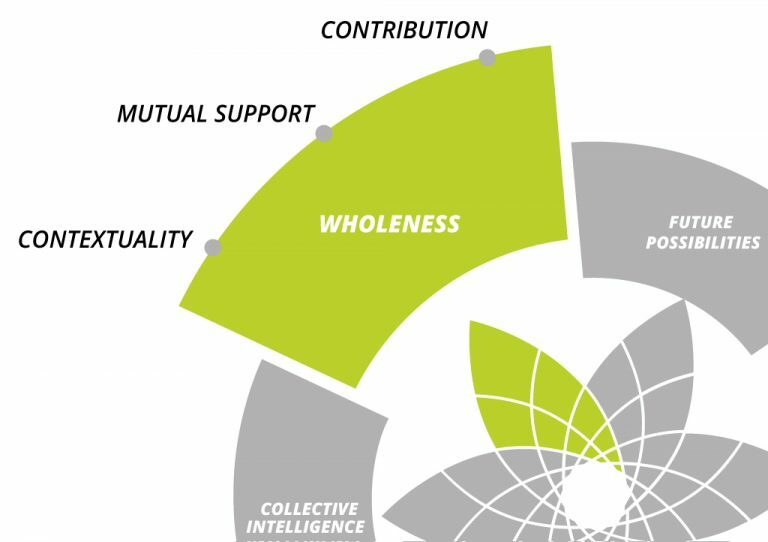 The dimension of wholeness refers to the competence to see a larger picture and stay connected to the common good by opening up to seeing the bigger picture of a situation, acting in favour of the common good, continuously improving our contribution to sustainability and creating networks of mutual support. Contextuality The way we connect with ourselves, each other, and a larger context. The way we explore the larger context and place our action in it. Mutual support/ Vitality The way we enhance each other’s strengths. Contribution The way we use our gifts, assets, and capacity to make a difference toward a sustainable future. To use the compass in your daily life, we developed an online compass tool to navigate complex change. The beta version is already accessible here:http://compass-tool.net/. 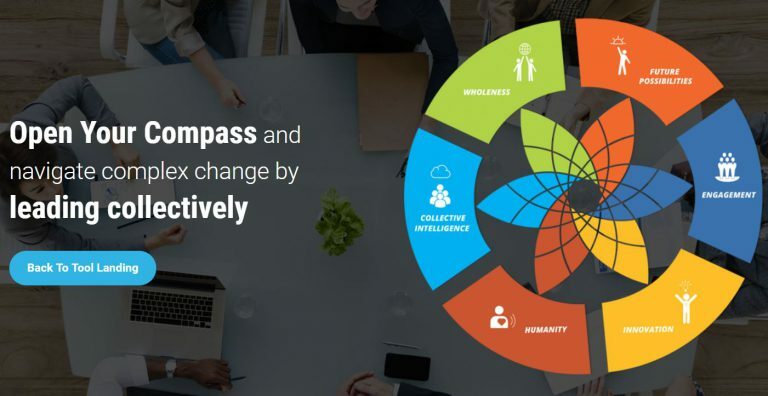 Now you can use our online compass tool to navigate complex change.